"Can we stop for a second? I have to dump out my shoes." It was the third time I had asked in the last hour. My trusted trail running shoes were being demolished by the sandy dunes of the Alentejo Coast. Each time I stopped, I emptied a whole shoe's worth of sand back to where it came from. The great breathing ability of my shoes on other trails meant that on sand, every grain found a new home in my shoe. We were near the end of our first day hiking the Rota Vicentina's Fishermen's Trail. The trail meanders its way along the incredibly stunning coast of Southwest Portugal and the Vicentina Coast Natural Park. 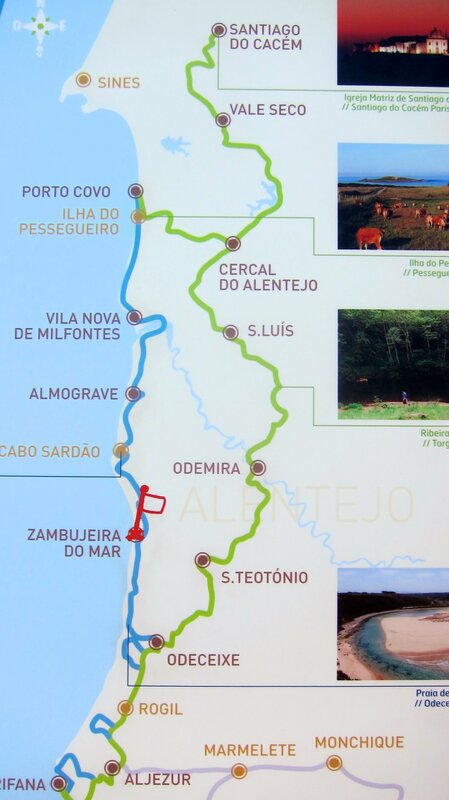 The trail is a project that was undertaken by locals and public entities in SW Portugal to preserve their natural environment as well as promote tourism in a sustainable way, allowing others to enjoy a very untouched and unspoiled region. In four days of hiking along the trail, we encountered less than 20 people walking the path - word has yet to get out about one of the most beautiful places in Europe. The route markers along the Rota Vicentina's Fishermen's Trail. The Rota Vicentina offers two trails - the inland Historical Way and the coastal Fishermen's Trail. Bikers and walkers share the Historical Way, but bikes are not allowed on the majority of the Fishermen's Trail. My love for ocean views made choosing the the Fishermen's Trail an easy one even though it meant hiking 60 kilometers (roughly 37 miles) from Vila Nova de Milfontes in the North to Odeceixe in the South in three days. The project was unveiled a little over a year ago and includes posted signs along the route, a tourist infrastructure of partner inns and restaurants along the path and a detailed website providing maps, route details and information. There is at least one local company arranging self-guided walks of the trail and almost everyone else we saw on the trail had utilized them for accommodation booking, luggage transport and detailed hiking information. We chose to plan and walk the route on our own, not only to save money, but because the infrastructure looked well established. We spent half the cost doing it on our own, which also allowed for some flexibility in our days and it was surprisingly easy to arrange. We stuffed five days of underwear and a couple of shirts in our daypacks (washing clothes along the way) and found it to be more than sufficient. After arriving in the beach vacation town of Vila Nova de Milfontes by bus from Lisbon, we soaked in the sun on the local beach, stocked up on food at the best supermarkets we had been to in Portugal and had a delicious meal of black pig and grilled fish at Tasca do Celso. Our inn, Casa da Eira, was basic and situated a few minutes from the beach and from the center of town. We went to sleep early in preparation for a long day of hiking ahead. Day one on the trail outside the town of Vila Nova de Milfontes. The sun was climbing in the sky and already starting to warm the ground at 8:30 a.m. when we left a little cafe to find our way out of town and onto the Rota Vicentina route. A little winding through the town's streets later, we were finally walking over the bridge to cross the river and hit the main trail. The day was warm, topping at the high 80s without a cloud in sight. The day's route brought us through farmland, along beaches, atop cliffs and finally through a few kilometers of sand dunes. Almograve is 15 kilometers from Vila Nova de Milfontes, but we had booked our accommodation at Monte Novo da Longueria in the town of Longueria, almost two kilometers east of Almograve. After trudging through difficult sand to finally reach Almograve, we turned east and walked along the road to reach Longueria. A small, family run cafe on the corner of town was our haven for a cold beer and a rest before another five minute walk to our inn. We were met by the sweet owner who had a tray of fresh squeezed juice and chocolate cake for us, along with a cold, refreshing pool. Our memories of the challenging, hot hike quickly receded and we enjoyed being in a tiny Portuguese town. The night before, a Scottish couple arrived at our inn close to 7 p.m. after hiking the trail from the opposite direction as we did. They had come along the route we were preparing for the next day and had us worried. They had gotten lost in the sand dunes and had added on close to five kilometers trying to find their way back to the route. I was dreading more sand dunes and the possibility of feeling lost in a desert under a blazing sun. We headed out of Almograve and followed the well-marked signs to reach the first beach. The trail followed a road to a neighboring fishing village and the path was easy to walk and we made great time even with a few stops to utilize the exercise circuit equipment along the way. A little fun along the route. The sand dunes eventually came into view and given the warnings from the night before, we were diligent about following the trail posts and markings on rocks along the way. We got turned around a few times, but easily found our way back to the trail, which stays along the cliffs for the most part. The day's views were incredible and reminded me of Hawaii, the Greek Islands and California's Mendocino Coast all in one. We luckily got a cooler day with some clouds to keep the temperature down. Although it was our longest hiking day at 24 kilometers, it didn't feel nearly as bad as the hot day before. The sand dunes were exhausting, but we left them behind halfway through the hike allowing us to walk faster and not have to stop as often to empty my shoes. Incredible coastal views along the Rota Vicentina. A scramble down to the fishing village of Entrada da Barca signaled the near end of our hike and we took a timeout to have a cold beer at the welcoming O Sacas restaurant on top of the hill. The walk from there into Zambujeira do Mar was mostly flat along the road and our inn was fortunately right off the trail. Another basic inn, but redeemed by its wide open patio and fresh baked bread delivered right to our door in the morning. I woke up early to prepare for the final long day of our hike. The sand that kept getting into my shoes and socks (thank you dry-wicking socks), had caused a few blisters on my feet and fortunately I remembered to bring a few bandaids along. 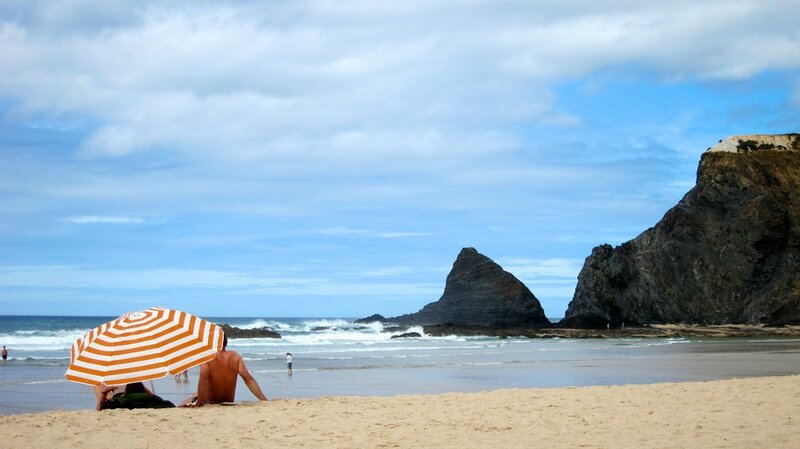 Zambujeira do Mar is a idyllic coastal town with white houses perched high on the cliff and a beautiful beach below. As we walked out of town, I had wished we stayed a little longer to enjoy the slow pace of life happening around us. Alas, we had 18 kilometers to go to reach our final destination of Odeceixe. Final push to get to Odeceixe. The day had us along cliff tops, but mostly walking downhill and climbing back uphill as we passed numerous beaches and alcoves. The sand dunes were back for a portion of the hike and hiking uphill with sand in my shoes had me ready to throw my shoes out into the ocean. The views were again spectacular with rock outcroppings of all shapes and sizes, wide open beaches and turquoise water crashing against the cliffs. How did we get so lucky to live this life? It turned out to be the most technical hiking day given the somewhat demanding uphill climbs and descents on craggy rocks. After close to 15 kilometers, the beach of Odeceixe came into view from far below and we rejoiced in almost being done with the day. Odeceixe beach from the trail above. The trail brought us down to the river near the shores of the beach, but the town of Odeceixe was still a few kilometers off to the east. We walked along the road for what seemed like ages and finally reached a bridge to town. I checked Google Maps on my phone and saw that our inn was still a good 20 minute walk away - and the only way was up. We started to wind our way up the cobblestone streets and out of breath, finally reached Casas do Moinho. It was perched on the hillside with views of the town's windmill and the nearby hills. A refreshing pool awaited us and we were happy as could be until we were told our room at the inn is deeper into the village, up another hill. A never-ending day of walking. We stayed in Odeceixe for three nights to relax and enjoy the local beach. We eventually got used to walking up and down the town's hills to get what we needed. We walked the Rota Vicentina one more day out to Odeceixe beach and it actually felt good to hike again, especially ending at a gorgeous beach with refreshing water and entrancing waves. Relaxing on Odeceixe beach with the locals. We were turned onto the Rota Vicentina from a friend of a friend who had lived in Portugal. I don't know if we would have found it otherwise and it would have been a shame. It was an amazing week in one of the most beautiful places we have ever been. It is a challenging, but very doable hike and ends in quaint towns that are really nice. There is usually a cold beer waiting at a local cafe at the end of the trail too. The people in the towns we visited were kind and entertaining and always patient with our lack of knowing or understanding Portuguese. Being able to glimpse a little of local life in rural Portugal was a treat we won't soon forget. The trail's website has a lot of great information and I highly recommend reading through it in detail as you start planning. Getting there: Regular buses leave Lisbon for the beach towns in Alentejo. Rede Expressos is the main bus company running the routes, which depart from the Sete Rios bus station in Lisbon. Sete Rios is easy to get to on the Metro when in Lisbon. You can check timetables and routes on the Rede Expressos site and book tickets in advance. If you book tickets in advance, keep the reservation number and use the automated machines at the bus terminal to print your tickets. We took a bus from Lisbon to Vila Nova de Milfontes and a bus from Odeceixe back to Lisbon. The buses are new, safe and have free Wifi! Just remember, you are traveling by bus, which requires some patience with arrival times. What to do with luggage: The inns along the route will transport your luggage for a fee if you ask in advance. We chose to leave our main bags at the hostel we stayed at in Lisbon and only took a small backpack with us along the route. We packed light, washed our sand-filled socks in our hotel sinks and just bought provisions each morning before leaving town. Every town had a market where we could get cold water and enough food for lunch along the route. I even carried my computer with me, which wasn't fun, but it didn't kill me. Maps and the route: The PDF documents on the Rota Vicentina site include maps and directions that are detailed enough to get you along the route (I downloaded them all to the Evernote app before we left). I had my iPhone to use Google Maps and the compass, but rarely needed to use it except to find our inns once we reached the towns where we stayed. As long as you pay attention as you walk, you can find the trail markings relatively easily and stay on the trail. Booking accommodation: After determining how much you want to hike each day, look at the interactive map on the Rota Vicentina site to see where inns may be located. I would recommend trying to stay as close to the towns as possible so you aren't adding extra kilometers to your hike each day. There are other hotels in the towns, which are not listed on the Rota Vicentina site so if you have the time and desire, research the town accommodations using other resources. We were happy with all the places we stayed, but two were more expensive at 80 Euros a night. I booked rooms via their websites, Booking.com and by emailing the inn owners. All of them got back to me very quickly. You will need your passport when checking into all of the inns so make sure to bring it with you. We arranged our hike about a week and a half before we arrived in town. It took a few hours of sitting down and actually planning, looking at timetables and accommodations, but all in all, was easy to do.